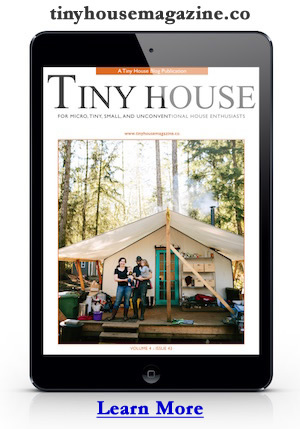 These are 1:87 scale miniatures of the Tiny Houses from the book 101 Tiny House Designs: The Ultimate Collection of Tiny House Design, by Michael Janzen – a book of ideas and illustrations for tiny house dreamers. The roof and loft are removable to allow you access to the interior. The wheels are fixed and do not roll. Some minor details are different from the house pictured in the book to permit it to be 3D printed. These models are available in a a few different materials, each with its own properties and cost. Tiny House #1 from the book 101 Tiny House Designs. This miniature comes apart into 4 pieces for easy access to the interior. There is no furniture inside. The scale is 1:87, which is the same as the popular HO model train scale. So if you want to furnish your model it’s easy to find 1:87 miniatures. Close inspection shows some of the fine 3D printing lines. The material shown here is frosted detail plastic. Tiny House #19 from the book 101 Tiny House Designs. This model comes in three pieces for easy access to the interior. Close-up of this wedge shaped tiny house design. This design has all round windows. Here’s another look at the round windows.